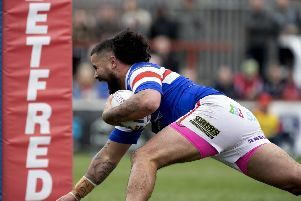 Trinity have the opportunity to pick up a second home win in six days when his former club, Huddersfield Giants, visit Mobile Rocket Stadium, Belle Vue, on Friday. 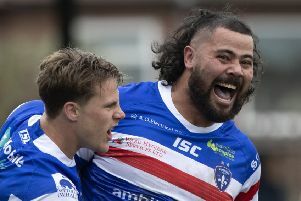 Jacob Miller celebrates after scoring against Salford. The 33-22 victory over Salford Red Devils yesterday was only Trinity’s second at home this year and they have been beaten on their own turf three times. With Trinity battling to attract more support, Brough admitted it is important to give their home fans something to cheer about – and says they need to keep the feel-good factor going this week. “It’s not ideal,” Brough conceded of Trinity’s home record. “We are a club that’s trying to get out in the community and get bums on seats so it was important we got that win, for the fans as well as the club. “We could have been ninth or up in the top five so it was quite a big swing, that two points. Trinity are fourth in Betfred Super League with more than a quarter of the season completed, but Brough insisted they won’t waste time this week gazing at the table. Giants are on a two-match winning run and will travel to Wakefield in good form. Brough moved from Giants to Trinity last autumn, but stressed it is just another game for him on a personal level. “I’ll just go out and try and do my job as usual,” he said. 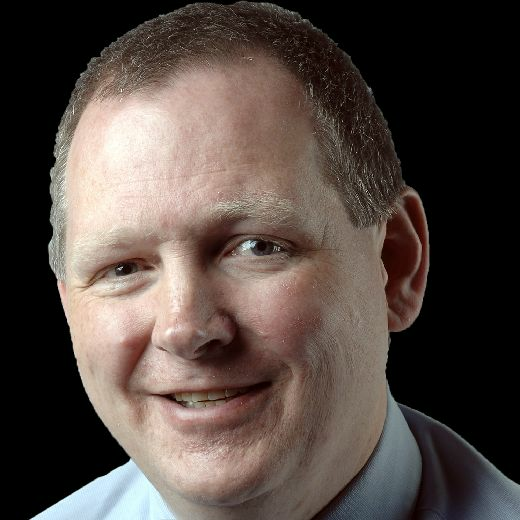 “They have played some good rugby the last couple of weeks, back-to-back wins, so they will have a bit of sting in them. “But everything has got to be about us, we’ve got to concentrate on our own job. We know what we can do when we get our skill right and our execution right – we are quite a hard team to beat. Reflecting on the Super League game two days ago, Brough said: “I thought it was two teams who were pretty much desperate for a win. “The game ebbed and flowed a bit like that, but I thought we did some nice stuff. Trinity were 24-10 ahead at the break and 20 points clear midway through the third quarter, but Salford scored two tries in three minutes to cut the gap to eight. After that Trinity were put under pressure, but clever game management ensured Salford did not get any closer. Brough booted a penalty and drop goal to keep the visitors at arms’ length and paid tribute to Wakefield’s pack for allowing him the opportunity to control things. He said: “Our forwards went through them quite well and gave me a bit of time to put some decent kicks in. It’s great playing behind them, it makes your job a bit easier.